First things first: If you haven't had a blog post go viral yet then…congratulations!!! (I bet that's not what you were expecting me to say?!) That's actually a good thing, because it means you're in the perfect position to set yourself up for success as soon as it happens. Trust me — every second you're not taking action on a viral post means less money in your pocket. So, if you're wondering what to do when a blog post goes viral, these are the steps you should take. If you find these viral post tips helpful, please share this image on Pinterest. PS: I included a section at the end for when your video goes viral on YouTube, too! What Constitutes a Viral Post or Video? That's highly subjective. For some people it might mean thousands of page views in a single day, for others…millions. A site like nbc.com might not consider a post viral unless the views reach well into the millions since their everyday traffic is so high. However, a typical blogger may consider views of 100k, 50k, or 10k in one day as “viral”. If your stats are significantly higher than normal, if they make your eyes pop and your jaw drop, or if you start doing the happy dance around your house when you see your Google Analytics dashboard…go ahead and classify that as viral. You'll save yourself a lot of stress…and set yourself up to optimize your earning potential…if you take these steps now. Download the WordPress.org app for free. Log in to your WordPress.org account. Scroll down to notifications and click on it. Scroll down to the WordPress app and click on it. Next to “Allow Notifications”, push the slider button to the right so it appears green. Congratulations on that easy setup! 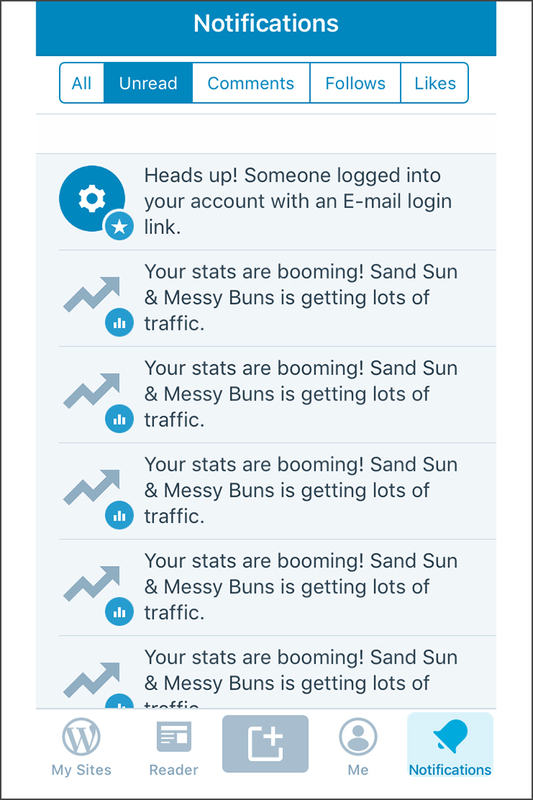 Now you'll receive a notification as soon as a blog post begins bringing in abnormally high levels of traffic. Your server may quickly become overwhelmed with a viral post and your host will need to increase your site's bandwith to handle the surge. You'll also need to prepare yourself mentally, because a viral post sometimes stirs up controversial opinions and comments. Check and triple check your grammar on the post. Make sure the links are working properly. Decide if the post is even something you want representing your brand (then delete or heavily revise it if the answer is no). 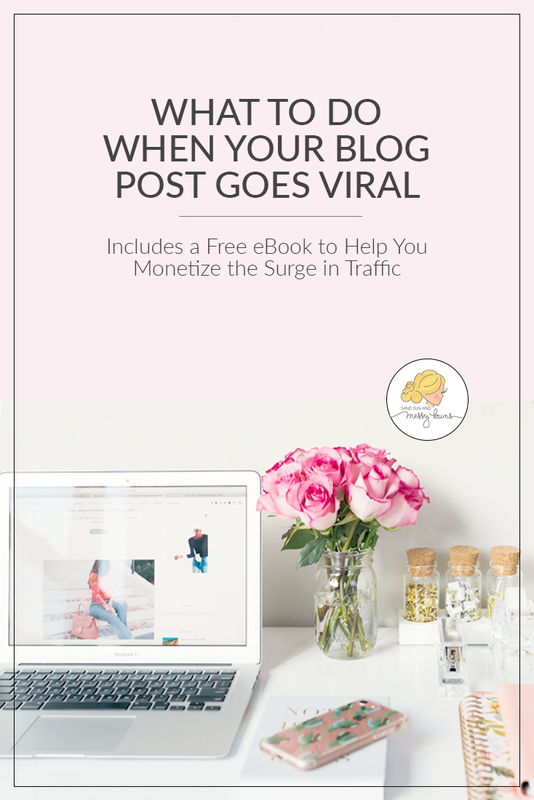 One of the reasons bloggers love viral posts is because it offers the ability to earn significant amounts of money in a short period of time. Ruth discusses this more in her guide, but there are multiple ways to do this. Affiliate links are the most common option. We don't normally use ads on our site, because we prefer a cleaner look, but we keep a media.net account active strictly for the sake of monetizing viral posts. If you don't like the look of ads on your site, only use them on a viral post during the time when it is generating massive levels of traffic — then take the ads down. This section of the ebook was particularly handy for us! Ruth advises protecting your content with a clearly visible copyright notice and watermarking your photos. We've had our photos used without permission in multiple YouTube videos that have views in the multi-millions. It would've been so nice if they'd at least linked back to Daisy's channel so she could've possibly gained new subscribers from their actions. Don't be afraid to file a DMCA takedown complaint if (and when) misuse occurs. Take advantage of the traffic boost by funneling visitors to related content on your site. Make sure you include links to relative posts to keep people on your site as long as possible. Don't go overboard with links, but definitely incorporate a few to your most relevant posts. You never know when a reader who obviously connected with your post may develop into long-term fan of your site. But that won't happen unless you have a way to reconnect with him or her! Make sure you include links to your social media channels so you can interact with new readers on your favorite platform. You also want to be sure to capture their email address. Viral posts are temporary, so enjoy the boost as it happens. Your blog will go back to normal (or a new normal — hopefully with increased daily traffic) eventually, so enjoy connecting with new readers while they're on your site. Once you've had a post go viral, dissect it to determine what caused such mass popularity. Then, create a new post on a similar topic and try to duplicate the feelings and touchpoints that made the original post go viral. 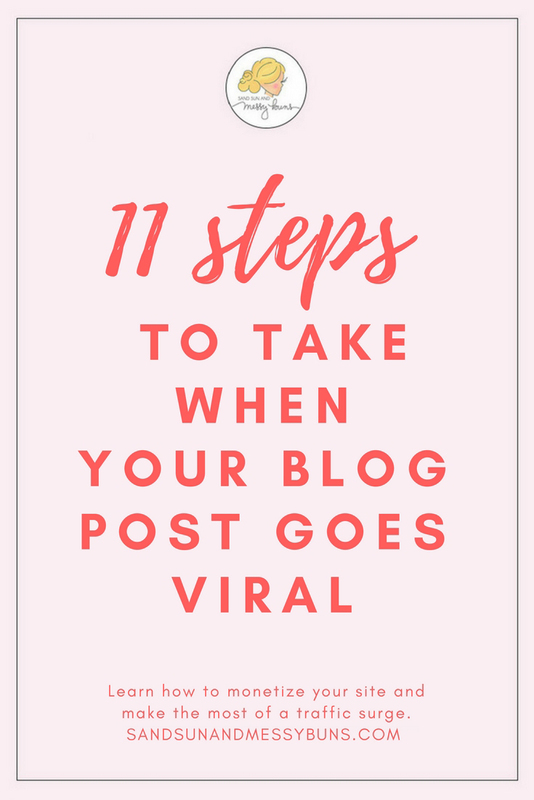 Don't forget to download your free copy of 10 Steps to Take When Your Blog Post Goes Viral. It goes so much more in-depth than I did in the short little snippets above. Does your post have a pinnable graphic? If not, create one in Canva as soon as possible and include it after the introductory paragraph of your post. Include this sentence, or something similar, in your closing paragraph as an additional reminder: “If you found this post helpful, please share it on Pinterest!”. Make sure you have a “Pin It” button on your photos that makes images simple to share, even for tech-challenged readers. (Download a plugin like Social Pug for easy sharing. ) Finally, create multiple pinnable images so readers can share the one the like best. If you're running a one man (or woman) show on your blog, you may need additional help for an hour or two when a post goes viral. A virtual assistant, or VA, can respond to blog and social media comments, set up ads, proofread posts, and more. Expect to pay anywhere from $15 – $40 an hour (even less on Fiverr, but the quality is always as good there). Rate depends on the VA's experience level. Try the Horkey Handbook website for quality VAs. Videos differ slightly from blog posts, because videos earn money based on their number of views. (That only happens with blog posts when you're a member of a PPV ad network.) That means the money can add up very quickly on YouTube, and is probably why so many people are willing to sell their soul for a shot at a viral video. YouTube may contact you to implement advertising once a video starts to take off, but it's best to be proactive. Try to get approved for Google Adsense as soon as you meet the minimum requirements for your YouTube account, so you can begin monetizing all of your videos. Ads are annoying, so you don't want to include them too often on your channel. An opening ad and one or two overlay ads is common on most YouTube channels. Once a video goes viral, go into your YouTube dashboard (in the Creator Studio under “Monetization”) and increase the number of ads on that particular video. For a longer video, consider 5 or more overlay ads. They're unobtrusive, and people can always “x” out if they don't want to see them. If YouTube is suggesting other videos of yours, you may want to increase the number of ads on all your videos during the viral phase. I always create pinnable images for Daisy's YouTube videos so I can share them on Pinterest, and I suggest you do the same. If one of your videos goes viral, you'll already have the image available and can promote it on Pinterest to gain even more traction. I hope this post was helpful! If so, please share it on Pinterest so others can benefit. If you have additional tips to add, I'd love to hear them. And if you have a post that's gone viral, please share that in the comments below so others can try to duplicate your success. 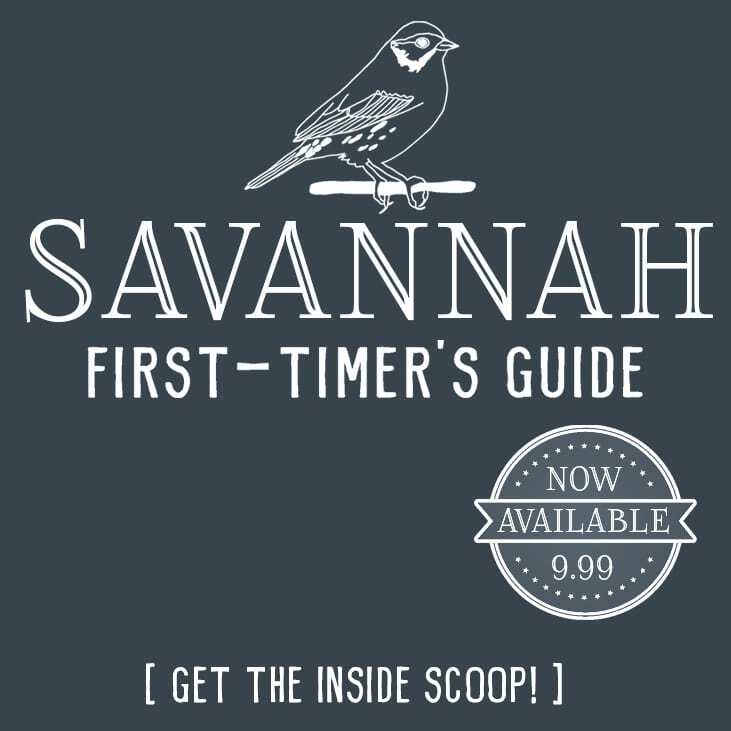 Daisy's most viral video is her Fake Freckles Tutorial with over 800k views and 1.8 million minutes watched, and my most shared blog post is The Ultimate Guide to River Street in Savannah, GA.
All of these are good tips!! I don’t think I would’ve thought about it crashing my site. It’s good to be prepared! This post is amazing! I wish I had read it several months ago when I had a post go “semi-viral”, but I’m also happy to read that I did almost all of these things!!! It’s so exciting to see any post get extra love, but sometimes it is hard to see it come back down to normal. Lol it’s wonderful motivation though!! I am relatively new to blogging as of the end of 2016 and I haven’t had a post go viral yet, but like most, I’m chomping at the bit for that to happen just because it’s so gratifying to know you’re doing something right! I love t his post because it gives me an idea of which goals to pursue next and tells me how to handle it when good things happen! Valuable info right here! I don’t know that any of my posts have actually been viral but I’ve been able to work with some of my most popular posts to increase traffic and subscribers significantly. That’s awesome! Increasing subscribers is key. That’s always my top goal and what the “pro” bloggers seem to recommend most. This is really great info to know BEFORE a post goes viral (I’m certainly in that category). Thanks for educating us! I will be checking out some of the links and additional info! Thank you for the reminder to download the WordPress App. That’s been something I’ve been meaning to do. Really helpful tips on how to handle posts that go viral. I love seeing the notification from my wordpress app! It’s so exciting. These are great tips! Thanks for sharing. This is such a great post! I’ve seen a lot of articles on HOW to make a post go viral, but I’ve never read one on what to do when it actually happens. I wish I had known some of this when my first post went viral…I literally had no idea what to do, haha! These are really great tips! It’s always so exciting when a post goes viral. I’ve had a few posts go viral (thank you Pinterest!) and I’ve made sure to go back and edit, edit, edit, and promote like crazy. God Bless Pinterest. 🙂 It’s such a fantastic source of traffic. I rarely promote pins on Pinterest, but I fully believe in doing it when you have a post going viral! Great advice!! I have an android and it is the same to set up the alerts, I never thought of doing that but it is a great idea!! You don’t hear many people talking about how a viral post can affect your bandwidth, great job!! I feel like when I sometimes read these things everyone says the same thing, however, yours was very informative!! LOVE IT!! I wish I could answer that, but I don’t own an android so there’s no way for me to test it out. I’m happy the tips were helpful! For sure! I think it’s most important to make sure your site doesn’t crash (because you don’t want people to associate your site with a negative experience), but after that it’s good to focus on how you can serve your readers best by giving them more of that topic — since they were so obviously drawn to it. I’ve heard of a lot of blogger friends who have had their sites crash when a post goes viral due to not having quite enough space through their host. That would be so disappointing! Great advice on how to be prepared and what to do after a post is already going viral! It happens — especially if you’re on a shared server that is already overloaded. There are a few hosts that are known for overloading their servers (ahem, Bluehost), so if you have one that’s known for it and your site starts getting popular, it might be worth looking into dedicated hosting — or at least VPS.